Bandai’s announced the first obligatory Legend Rider item for Kamen Rider Ex-Aid with a pre order page having gone up for the DX Heisei Legend Rider Gashat set. 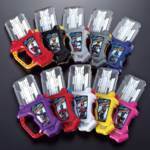 Of course, each Gashat will work with the Gamer Driver itself having a unique tune for each Rider in addition to being compatible with Ganbarizing arcade machines. 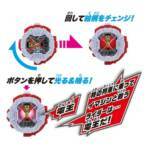 The set will cost 16,200 yen(approximately 1500 yen per Gashat), pre orders will begin tomorrow: Tuesday January 10 2017 and will be shipping February 6 2017. 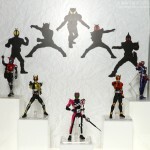 BigBadToyStore.com Newsletter for September 24th – Kamen Rider Hibiki In Stock! Our site sponsor BigBadToyStore.com has released their latest newsletter and we’re happy to report that the popular S.H. Figuarts Kamen Rider Hibiki is now in stock and ready to ship! This is a great chance to pick up your figure! Check out what else is now available below! PRE-ORDER THE FOLLOWING FIGURES TODAY! NOW IN STOCK! ORDER AND SHIP TODAY! Our friends at BigBadToyStore.com are unbeatable in customer service and satisfaction! Take advantage of their Pile of Loot system to save on shipping! Read their full newsletter by clicking “Read More” below!